The abundance of marine life makes Roxas City the “Seafood Capital of the Philippines.” This environment-friendly city is home to one of the richest fishing grounds in the country. Being a recipient of the Cleanest and Greenest Component City in Western Visayas Award in the Gawad Pangulo sa Kapaligiran (GPK) Cleanliness and Environmental contest is a clear testament of its people’s commitment in ensuring a healthier and brighter future for all its residents and visitors as well. Recently, Roxas City has been a recipient of major awards from various government agencies. The Department of Health (DOH) awarded this city with the Red Orchid Award for being “100 percent tobacco-free.” It has also gained the Department of Interior and Local Government (DILG) Seal of Good Housekeeping and lauded the Best Police Station in the region by the Philippine National Police. The City of Roxas, once known as the municipality of Capiz is the capital of the province of Capiz. In 1569, Captain Diego de Artieda who was sent by Miguel Lopez de Legazpi from Cebu, landed on the town of Pan-ay and proclaimed it as the capital. Later the capital was moved to its present site upon discovering that the town of Capiz was near the sea where they can have better docking facilities. The Spaniards saw the long coastal cover and envisioned a trading and shipping center. Ports were constructed in Libas and later in Culasi. In 1590, the Navy of Acapulco, Mexico made Capiz port its arsenal (naval yard) where they can seek shelter when the sea was rough. Capiz then eventually grew into a bustling port and several houses of stones were built. The social and political status enjoyed by the native chieftains of Capiz often resulted in mixed marriages with the Spaniards. The mestizo descendants became the base of the principalia or influential citizens. Their privileged positions allowed them to build houses around the favored square of the poblacion – around the church and the government complex. In 1746, Capiz was made the seat of the politico-military government, although it was ecclesiastically controlled by the Bishopric of Cebu. In the latter part of 1795, under Gobernadorcillo Miguel Bautista, the old road to Baybay Beach was built as an extension of San Roque Street. The town of Capiz was frequently attacked by Muslims that in 1814, stone forts at Baybay Beach (Baluarte) were built through the initiative of Gobernadorcillo Jose Consolacion. Capiz became a chartered city on May 12, 1951 through House Bill 1528 sponsored by Ramon Acuña Arnaldo, the representative of the First District of Capiz. It was approved by President Elpidio Quirino on April 11, 1951 as Republic Act 608. Consequently, the town was named Roxas City after her greatest son, President Manuel Acuña Roxas, the last president of the Commonwealth and the first president of the Philippine Republic. Roxas City is situated just east of the north-central coast of Panay Island with geographic coordinates of 11°35′ N, 122°45′ E. Its boundaries are: the Sibuyan Sea to the north, the municipality of Panitan to the south, the municipality of Ivisan to the west, and the municipality of Panay to the East. It is located 250 nautical miles (460 km) southeast of Manila and 135 kilometres (84 mi) northeast of Iloilo City(Regional Capital). Travel time to Manila is 45 minutes by air and 18 hours by sea. The language spoken in Roxas City are Capiznon and Hiligaynon. Based on the 2010 census, the city has a population of 156,197with a density of 1,542.89/km2 (3,996.07/sq mi) people. And reaching up to 200,000 during daytime due to the influx of people from neighboring provinces from northern Iloilo, to do business, study, vacation, etc. The city usually exports goods through its national port and the port of Iloilo. Exported good are mostly agricultural and marine products like rice, corn, copra, kapis shells, green mussels or “tahong”, oyster or ‘talaba”, dried fish, prawns, crabs ans shrimps. Roxas City has basically an agri-based economy. Farming and fishing are the major economic activities which claim 52.87% of the city’s total land area. Although agricultural, the city is now moving towards commercialization and industrialization as it is the center of trade and commerce not only in the province of Capiz but also in the northern part of Panay Island. The city has a national port, a fishing port and airport. Visitors or transients in the city could stay at any of the nineteen (19) available accommodation facilities and they could dine at the twenty-one (21) restaurant and thirty-nine (39) refreshment parlors. 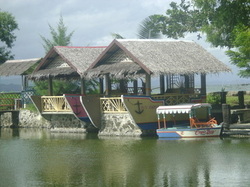 Capiz Bay Resort – this fishing area attracts guests through its sure catch, hands on, fishing experience. The “hook and cook your catch” theme is one of the resort’s popular attractions. 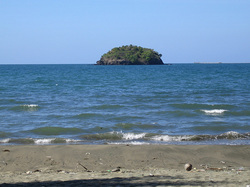 Mantalinga Island – ideal diving spot for scuba divers and a perfect rotunda for sailboat (dilayag) and kayaking contests. This island was also nicknamed as “Good Luck Island” due to the belief of the local fishermen that it gives them luck every time they go out to fish after they wrote the name of their boat at the side of the island. 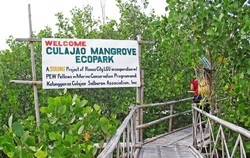 Culajao Mangrove Eco Park – perfect for educational tours, weekend trips and excursions or for a simple family picnic. It stretches within 4.69 hectares and is the home of the diverse marine and mangrove species. They have several packages for tours that include a bamboo raft (banca) ride along the river to get a closer look of the 19 species of mangroves that serve as habitats for a vast variety of fishes, crustaceans, mollusks, and shells. Listen to a live composo about Mangroves and Culajao. Watch the herons and other exotic bird species flying around catching fish.